FONTANA, Calif. -- On Saturday night, family members shared their grief and their memories of loved ones killed in a tragic crash on the 10 Freeway in Fontana, where a good Samaritan also died trying to help them. The show of support continued into the night as a family reunion turned into a heartbreaking fundraiser after a grandmother and two grandchildren were killed by a suspected drunk driver. 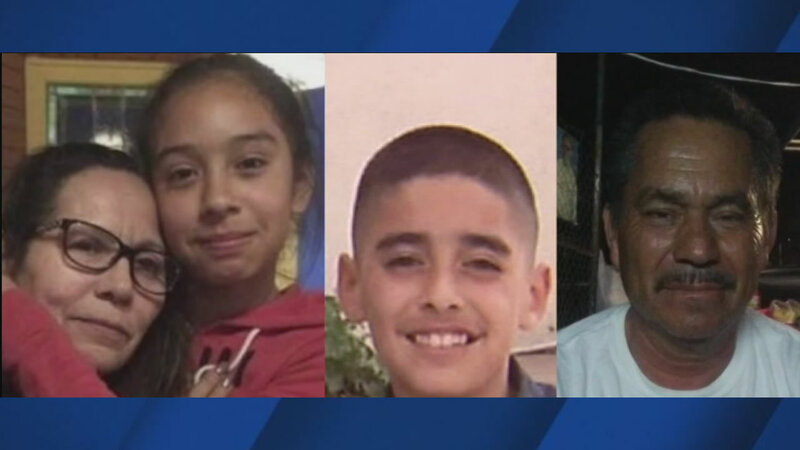 Twelve-year-old step siblings Ailyn Miguel and Isaac Briseno and their grandmother, 58-year-old Maria Rodriguez, were killed Friday when they stopped on the side of the freeway due to car problems. The children's mother, Maria Briseno, was the sole survivor in the family's Honda. "You can't put into words. She's not stable. It's something that I think is going to take a long time for her to cope with it. It's tough, she lost both of her kids and her mom," said cousin Rocio Ramirez. Jose Prieto, 60, who had stopped to help the family, was also killed. His loved ones said they will hold a fundraiser for him in Rialto Sunday afternoon. Investigators said 64-year-old Luis Sanchez slammed into all four victims on the shoulder of the freeway. Police found opened beer cans inside of his truck. They were waiting for toxicology tests to determine whether he was under the influence during the crash. What would have been a fun family gathering became a sudden and solemn food fundraiser as the Briseno family prepared for three funerals. The community turned out in a great show of support - whether they knew the victims or never met them. "We're blessed, we are blessed. We didn't expect this much people this early. We had planned it to start at around 12 - at 11 we had a line of people waiting," Ramirez added. Four lives were lost in the tragedy investigators say likely could have been prevented. "The person that did this, they need to pay, they do," said fundraiser attendee Briana Nuci. "I hope that justice is going to be served." GoFundMe pages have been set up for the Briseno family and for the family of Jose Prieto.